On April 23, Mark di Suvero’s 53-foot high, 21,220-pound steel sculpture Orion will be reinstalled in front of the U-M Museum of Art. A day after the return of his sculpture, the internationally renowned artist will participate in a public conversation with UMMA Director Christina Olsen at 5 p.m. on April 24, where they will discuss the significant role that public art plays on a university campus. According to Olsen, who also chairs the U-M President’s Advisory Committee on Public Art, di Suvero’s visit is part of a “reimagining” of U-M’s public art program. “This is a moment for the community to come to together to hear about and discuss what the impact of a collection like U-M’s can have on the future of the University and the world,” she said. U-M President Mark Schlissel will be present on April 24 to welcome di Suvero, who will also receive an honorary Doctor of Fine Arts degree at U-M’s Spring Commencement ceremony on May 4 at the Michigan Stadium. Initially exhibited at Chicago’s Millennium Park, di Suvero’s Orion (2006) first arrived at UMMA as a long-term loan in 2008, helping to celebrate the Museum’s then-new Maxine and Stuart Frankel and the Frankel Family Wing. In April 2018, it was removed in preparation for storm water repairs on UMMA’s grounds, which provided an opportunity to send the sculpture back to the artist’s studio in New York for some conservation and a fresh coat of vibrant, orange-red paint. The sculpture, which has become an Ann Arbor landmark in recent years, is one of two of di Suvero’s massive steel works that welcome visitors to UMMA—Shang (1984-85) is a kinetic sculpture that invites passersby to “swing” on its suspended platform. 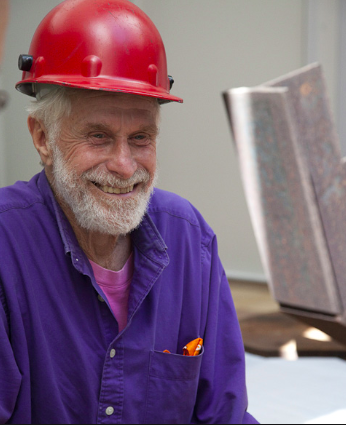 Born in Shanghai in 1933, di Suvero immigrated to the U.S. in 1941 and received a bachelor’s degree in philosophy from the University of California, Berkeley. He has received several honors in his career, including a Lifetime Achievement in Contemporary Sculpture Award from the International Sculpture Center in 2000 and a National Medal of Arts in 2010. UMMA’s “In Conversation” program is co-sponsored by the University of Michigan President’s Advisory Committee on Public Art. April 23: Starting at 8 a.m., Mark di Suvero’s “Orion” sculpture will be reinstalled in front of the U-M Museum of Art. April 24: “Making art public: A conversation with Mark di Suvero and Christina Olsen” will take place 5-6 p.m. at the U-M Museum of Art. The event is free and open to the public. May 4: Mark di Suvero will receive and honorary degree at Michigan Stadium during the spring commencement ceremony, which starts at 10 a.m. The University of Michigan Museum of Art has appointed Vera Grant to deputy director of curatorial affairs and curator of modern and contemporary art.